It’s a lot of tips everywhere what to buy as perfect Christmas gift to your husband, friends, children, parents. But I wasn’t able to find any tips for ScrumMaster gifts. So I decided to write some to make even ScrumMaster happier and leverage their knowledge. There’s never enough knowledge and experiences. The first tip is to read a good book. I want to recommend my book The Great ScrumMaster: #ScrumMasterWay which is practically oriented, full of tips. It’s a field guide for every ScrumMaster, it got great feedbacks so I believe this book is a great gift. But let’s share more book tips – you can start with Essential Scrum from Kenneth Rubin which is the good starting point to understand the Scrum. If you want to move forward the next step is to get some coaching experiences. The Coaching Agile Teams from Lissa Adkins is the book you have to read. It’s great with a lot of knowledge from one of the best coaches I know. Another direction is scaling and a large project in huge organizations. The answer for scaling is LeSS – Large-Scale Scrum which is greatly described in the book Large-Scale Scrum: More with LeSS. If you are serious about scaling, this book is a must. Both authors Craig and Bas are excellent Scrum and LeSS trainers so it is worth to learn from them. The world dimension of #ScrumMasterWay concept represents three levels ScrumMasters shall operate. The third element is called Entire System. Though the time and energy ScrumMasters spend on each level differ based on the team or organizational culture and maturity level, they have to be present at every level to keep an eye on changes. As organizations are complex systems, you can stay here forever. There is always some change which needs your attention, there is always a better way how we can do things, there is always a better way of work. At this level, ScrumMasters shall look at the organization as a system, from ten thousand feet distance. Searching for organizational improvements. They shall become servant leaders, helping others to become leaders, grow communities, and heal relationships. Bring the Agile values to the organizational level. Address the system in its whole complexity and make it a self-organized network of great teams. At this stage, you can see your organization as a living organism. This living organism has one goal of which no one has doubts. This system takes experiments and learns from failures. The safety, transparency, and trust are deep in the system DNA. The culture value collaboration and trust which gives us an opportunity to come up with more innovative and creative ideas then hierarchical traditional structures. You might feel you are done, you made it. Please celebrate, it’s a huge achievement. And then let me remind you, there is no end of your journey. The goal is to achieve the right mindset of inspect and adapt every day. Being Agile is the star on the horizon, you can never touch it, but in short iterations, you can get closer. That’s what Agile is all about. 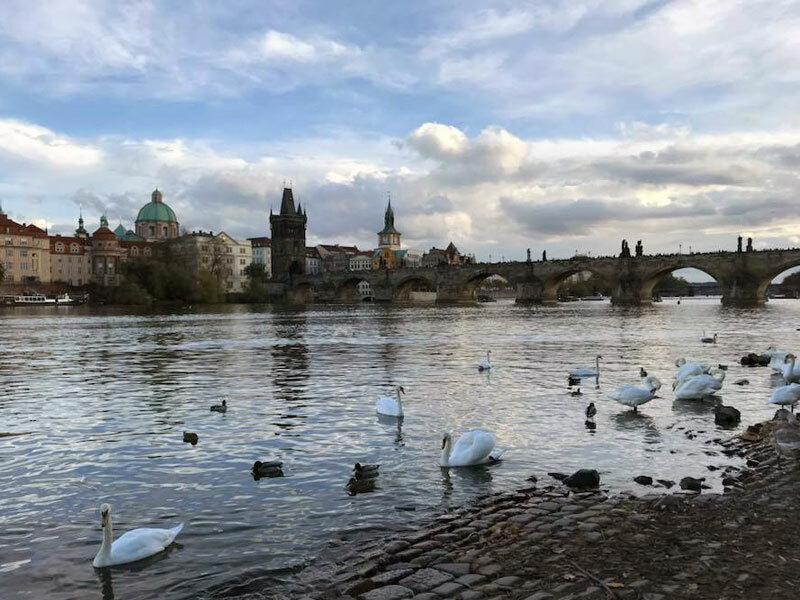 If you are struggling about how to create such Agile organization and how to work at this Entire System level of #ScrumMasterWay concept, join my Certified Agile Leadership class (CAL) which we now offer as the only ones in the Czech Republic and Slovakia. The world dimension of #ScrumMasterWay concept represents three levels ScrumMasters shall operate. The second element is called Relationships. Though the time and energy ScrumMasters spend on each level differ based on the team or organizational culture and maturity level, they have to be present at every level to keep an eye on changes. 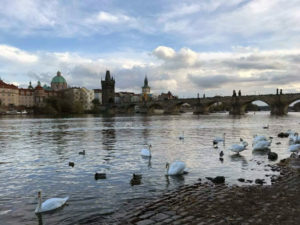 If you do it right, and your organization is not too dysfunctional with a lot of politics and difficult stakeholders and product structure, what you build at the Relationship level, could be sustainable in about three years and gradually you may gain more and more time to the next level of the Entire system. The Relationship level brings higher perspective. You are not focusing on the elements of the Myself dimension to the development team only but to the broader system. You look after all relationships your team has with anyone outside and use the mix of aspects from Metaskills, Learning, State of Mind and Leadership elements to improve them. ScrumMasters focus their teaching, mentoring, facilitation, and coaching skills to improve relationships between the development team and Manager, Product Owner, customers, stakeholders, and other teams. For example, you may coach the Product Owner to build a great vision, facilitate conversation with other teams, help the manager to understand how to change the performance reviews, and much more. Whatever helps the bigger eco-system to become self-organized, consistent and coherent. At this level, the eco-system begins to use the high capacity of the previously created high-performing teams in a meaningful way. We maximize work not done, is in the Agile manifesto. Too many companies are using Scrum just as a tool to deliver any idea which goes around. This level helps organizations to prioritize and focus on true value delivery. 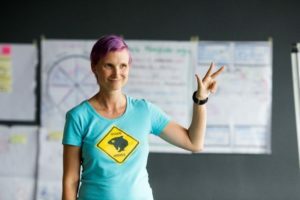 There are thousands of practices from this space you can teach (Story mapping, splitting patterns, Impact mapping, Lean startup, beyond budgeting, management 3.0). The list never ends, so keep in mind that it’s not about practices despite the fact that they can be useful but it’s about building the right Agile mindset. Increase transparency and openness. Help them to become a great team together with one goal. The world dimension of #ScrumMasterWay concept represents three levels ScrumMasters shall operate. The first element is called My team. Though the time and energy ScrumMasters spend on each level differ based on the team or organizational culture and maturity level, they have to be present at every level to keep an eye on changes. If you do it right, and your organization is not too dysfunctional with people actively fighting against what you build at My team level, you shall be ready to move to the next level in about six months. 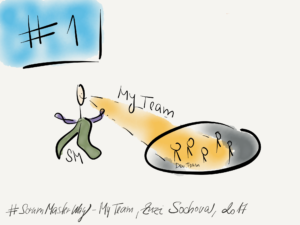 The first level of #ScrumMasterWay concept is My team. Being ScrumMaster at My team level feels like being a team member. They look at things from the development team perspective: Explain different Agile practices, facilitate Scrum meetings, help to remove impediments, coach the team, and make the team great. If people are only aware of the existence of this level, we often hear that ScrumMaster can be a team member at the same time, or it can rotate, or it shall not be needed at all after some time. They are all huge misunderstandings of the ScrumMaster role. My team level is a great start. If you do it right, it will help you to demonstrate the success of Scrum, and show you a way to the next level of addressing product success, and building an Agile organization. If you do it right, the team becomes not only cross-functional, and self-organized, but high-performing as well. The team will be significantly better that anything you ever experienced before. More productive, always improving, proactive and taking over the ownership and responsibility for the overall goal. You can’t skip this level, as this is something tangible, something which helps you to demonstrate success. Something which helps you to taste Agile for the first time. And get feeling how it shall be. The first Myself dimension will help you to address My team level and prevent you from falling into assistant or mother of a team. You are done when you build the great team from the group of individuals. You recognize it with a high level of energy, positivity, and activity in the team. Team members will be happy to go to work, they will enjoy it, and take other team members as friends. Let’s continue with the last element of ‘Myself’ dimension. As we already said in the previous blog posts, each element of this dimension is represented by a dice which you can roll every day of Sprint and choose the aspect you are going to take. The fourth dice stands for leadership. If you want to transform the organization, your leadership style shall change first. In this element, we talk about being a servant leader, creating the culture, feedback, motivation, collaboration, and leader-leader style. ScrumMaster is a leadership role. One of the aims of ScrumMaster is to make others work better, they are servant leaders. They can heal relationships, create communities, listen to others, have empathy, and think beyond day-to-day tasks and short-term goals. Only when you become servant leader you can be the great ScrumMaster. Agile needs the right culture. It’s all about us, how we work as a team. Be collaborative, support each other, take over responsibility and ownership for the team. ScrumMasters shall be using their leadership skills to create such culture because without it Agile and Scrum can never be successful. Give and receive feedback is critical for every leader. It’s important prerequisite to inspect and adapt. ScrumMasters shall be actively searching for feedback and find creative ways to allow people to learn from it. Part of the motivation is coming from the environment and culture. ScrumMasters support intrinsic motivation factors as they are aligned with their goal to create a self-organized team. Motivate through an understanding of the purpose and clear goals, safe to fail learning environment, and open and transparent culture. Collaboration is written in the Scrum DNA. Scrum is all about teams and collaboration. There is no individual work important in real Scrum, no individual goals. We do our best to achieve the goal – deliver value to the customer. The leader-leader model helps you to change the traditional leadership style of leader–follower where people are expected to follow orders into the leader-leader concept of servant leadership where leaders are here to help the other people to grow and become leaders themselves. Let’s continue with the next element of ‘Myself’ dimension. As we already said in the previous blog posts, each element of this dimension represented by a dice which you can roll every day or Sprint and choose the aspect you are going to take. The third dice is for choosing the approach – State of mind. The approach you take is important and can completely change the result you get from addressing the different situations. For every situation, you can choose one of the following aspects: observe, facilitate, coach, remove impediments, teacher and mentor, and increase positivity. Start every situation with observing. There is no rush. Then choose any of the following approaches, address the situation by facilitation, coaching, teaching and mentoring or increasing positivity and return back to observing to see how it landed. If it works, you can continue with the selected approach, if not it’s time to change. Keep in mind that you work at system level and systems are complex by nature so hard to predict their reaction. You have to inspect and adapt. Almost every situation can be addressed by proper facilitation. You can prevent conflicts by keeping the discussion in the problem space and prevent the situations when people takes it personal. Facilitator you shall be neutral. It’s their agenda, you only take care of the discussion flow. Coaching can help when the other approaches can’t. Coaching will raise awareness and grow the interest to learn or change. It will start thinking process and creativity. Through coaching you can help team to reach the next level and become great team. This approach is actually a trap for ScrumMasters. Way too many ScrumMasters takes this approach as a destination and become assistants or mothers. Instead, you can help team to identify impediments by proper root-cause analysis and help them to solve the impediments by themselves. ScrumMasters shall be the subject matter experts with hands-on experience from Agile and Scrum environment. 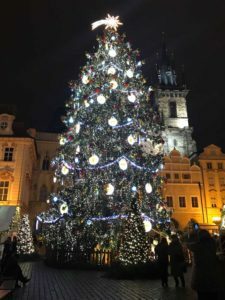 This approach is about sharing the knowledge and experience so people understand the purpose of individual practices, Scrum framework and Agile. Finally, increase positivity. Celebrate success. Search for short wins. The more positive the overall team and company environment is, the higher chance they have to become great high-performing team and bring overall organizational a success. Let’s continue with the next element of ‘Myself’ dimension. As we already said in the previous blog post, each element of this dimension represented by a dice which you can roll every day or Sprint and choose the aspect you are going to take. The second dice is for learning. Scrum Masters shall learn new things every day. This element shows a direction where you can focus the learning activity to gain Agile, coaching, facilitation, business, change, and technical skills. ScrumMasters you must be Agile enthusiasts, constantly looking for new practices, concepts, and ideas. Joining local communities, attending or speaking at conferences. Looking for trends where Agile is heading. The world is changing fast, so do Agile and Scrum. Without good coaching, you can’t create sustainable high-performing teams. So better start right away. There are many classes and books on coaching, plenty options to choose from. But after all, it’s all about practice. Start tomorrow and get better during the time. Facilitation is critical especially when the team is not that mature. Be ready to facilitate not only during meetings but anytime. Every conversation can go wrong, and create a conflict or misunderstanding. Be on a watch for those situations. As part of the mentoring and teaching, you will need to understand the Agile Product Ownership. Have an idea on how to form a vision, how to prioritize, how to build the backlog. 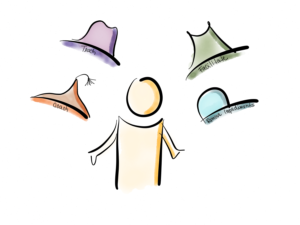 Help Product Owners with business Agility concepts. ScrumMasters are implementing change in organizations, they change their culture, and way of working. Such change is one of the hardest. You are change manager, change is your day to day job, so be better at implementing change. Finally, the most controversial aspect of this element is technical. It’s controversial because as ScrumMaster you shall not be a team member at the same time as you will lose the overview. The technical aspect here points to the Extreme Programming practices as continuous integration, shared codebase, auto-tests and TDD, BDD, pair programming, regular refactoring, agile architecture and continuous delivery. They are critical for team success and every great ScrumMaster shall have a decent knowledge about them. Let’s start with ‘Myself’ dimension. Each element of this dimension represented by a dice which you can roll every day of Sprint and choose the aspect you are going to take. The first dice is for metaskills. 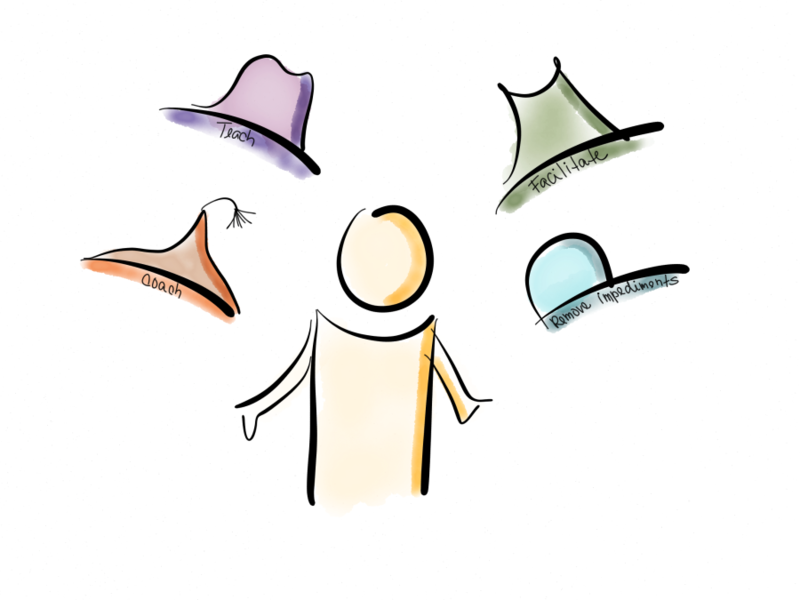 Scrum Masters shall be able to take the metaskills of teaching, listening, curiosity, respect, playfulness, and patience. Teaching is embracing the wisdom, ability to advise people, be a good mentor. Your knowledge and experience on different frameworks, concepts and practices are your ground here. Listening is a critical skill to be able to learn from the feedback and choose the right approach. We as human beings are not listening enough. Too often, we jump towards the closest solution and ScrumMasters are not any different. Good listening is a prerequisite of being a great facilitator, coach, and leader. Being curious helps you not to take sides. Be open to different situations and solutions. Find creative and innovative ways of approaching things. Working with team and organizations is a complex task. It requires different skills in order to address the complexity. Respect will help you to build trust and create safety environment. Respect different opinions, who knows what is right and what is wrong. At the level of a complex system, it’s hard to assess. Openness and transparency are your best friends here. It’s going to be a long journey, so make it fun. Bring the metaskill of playfulness to your day to day work. Take the same approach as if you were playing the strategic game. It is just a game, so enjoy every single day of it, don’t get frustrated when you don’t win the first day. The good game shall take some effort to play well. You have unlimited time as ScrumMaster, there is no hurry. You are not responsible for delivery, nor the short-term goals. Your goals can only be seen long-term when the teams are getting self-organized and high-performance. Only then people can see the ScrumMasters are doing the right job. You will never be finished, as Agile is not a destination, but a star on a horizon. There is always a better way, there is always a need for great ScrumMaster to guide us on our Agile journey. 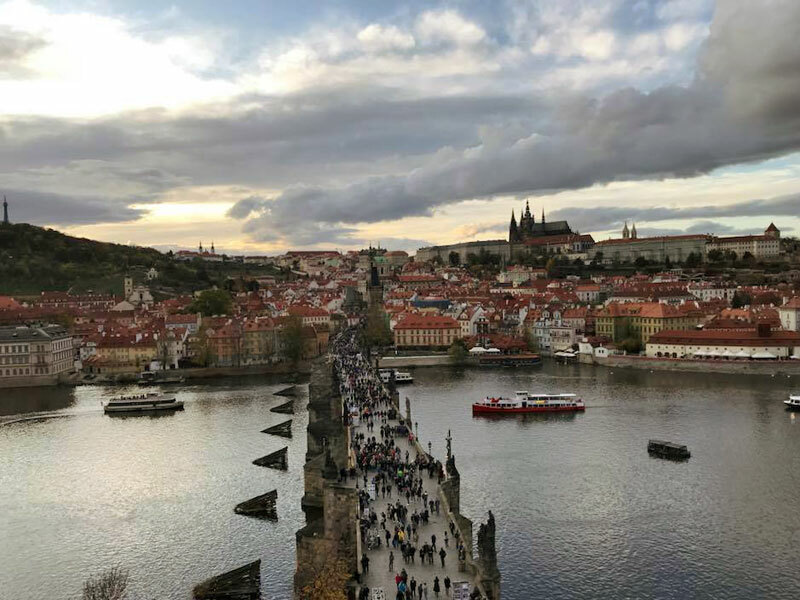 When I first time decided to write my new book The Great ScrumMaster: #ScrumMasterWay I have a clear picture in my head of what I have to write about. 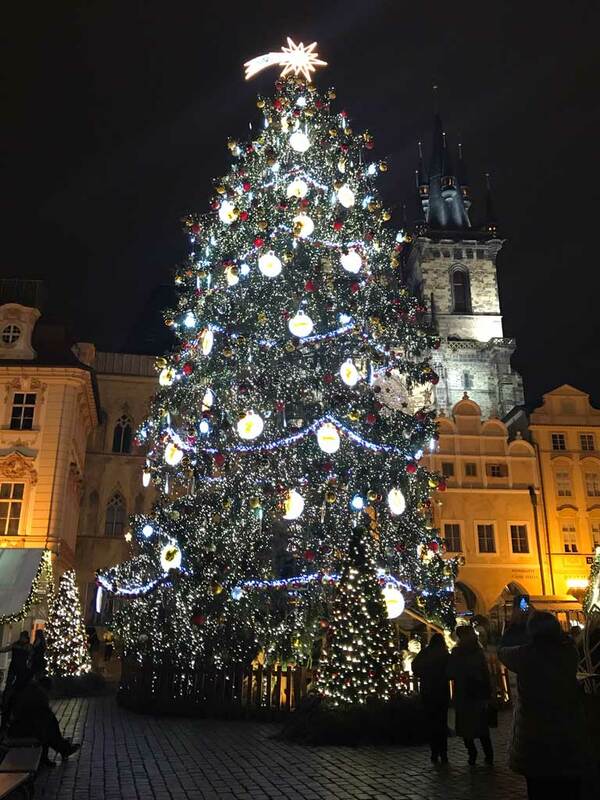 I wanted to share what I learned on my ScrumMaster journey, offer you hints on how to avoid problems, bottleneck, falls during the way, and give you an advice on how to become the great ScrumMaster. To make it consistent learning path, I combined all necessary elements which must be used to successfully get to the great ScrumMaster journey into the #ScrumMasterWay concept. At the beginning of my writing, I had only independent pieces. When I started to write the book, the elements clicked together and created the coherent whole of the #ScrumMasterWay concept which I’m now presenting in brief at a separate website and in the Great ScrumMaster book: #ScrumMasterWay which has been published in January by Addison Wesley. The concept is formed from my personal hands-on field experiences as a ScrumMaster and Agile enterprise coach which I got during my 15+ IT and Agile journey. 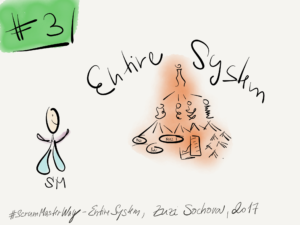 In the following blog posts, I’m going to introduce the core elements of the #ScrumMasterWay concept. 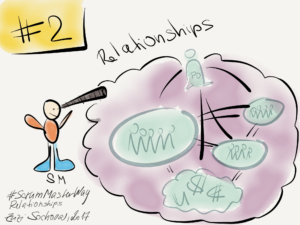 The #ScrumMasterWay concept is shaped in two dimensions: ‘Myself’ and ‘The world’. The first dimension is dedicated to your own mindset, attitude, and personal growth. They help you to develop yourself as a person and become a great ScrumMaster. They consist of four building blocks: Metaskills, Learning, State of Mind and Leadership. The second dimension is dedicated to the outer world represented by your team, broader product group or the entire organization. The great ScrumMasters shall be able to work at all three levels of the world dimension and use a mixture of all different aspects of Myself dimension elements. 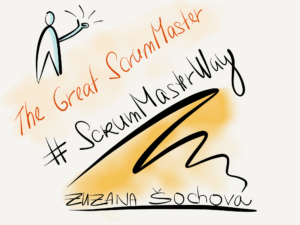 I hope the #ScrumMasterWay concept will help you to start your great ScrumMaster journey and help your organization to be successful in nowadays constantly changing the world.